We bandy around the term reference a good deal in hi-fi reviewing. What do we mean by it? Best we've ever heard, best in class, the ideal component, or something that conforms to our personal ideals? Actually, it just means a component we use as a baseline when listening to other stuff. It makes sense that we chose that reference carefully, that it conform to some measure of excellence, and that we have it on hand so we can compare other components to it. So who needs a reference? I do, along with my fellow reviewers. And so do audio manufacturers. Just as YG Acoustics most likely have some Magico speakers on hand and vice versa. You have to know how you compare with the best of the competition, and you also want to know what is possible regardless of price if you are designing something much more modest. The YG Carmel is good enough, if you believe the hype in their ads or the recent review in The Absolute Sound, that it may be a reference for a large number of speaker manufacturers. And if all those reviewers and manufacturers who might buy the Carmel as a reference did so, YG would probably have their production capacity stretched to the limit without selling a single pair to an end user. So the question I'm going to tackle today is this. Is the YG Carmel a good reference? I'll let you into a little secret, so you don't need to rush straight to the last sentence. YG Acoustics and The Absolute Sound are not completely out to lunch in their claims for the Carmel. There is certainly something special going on here. This review has been fermenting for an extended period. When such a significant component comes along it is important to listen to it using a wide variety of partnering equipment. The bulk of my listening involved the EMM Labs XDS1 feeding the EMM Labs Pre2 into a Bryston 4BSST�, using a Nordost Thor and Nordost Valhalla cabling throughout. I also used a Meridian G08 CD player, a NAIM UnitiQute integrated amp, a Micromega AS400 integrated amp, a Parasound Halo JC2 preamp, a Modwright KWA 150 Signature Edition power amp and my analog source, Linn Sondek LP12/Itok/Clearaudio Virtuoso Wood/Avid Pulsus with Cardas phono cable. I experimented with cables, switching to Atlas Mavros speaker cable and a variety of Gutwire cable. In every case a change in the partnering equipment was immediately noticeable, so clearly we are dealing with a very revealing speaker here. Also the Carmel seems to present an easy load for an amplifier � each one I tried was able to drive the Carmel without strain and sounded better doing so than any other speaker I attached them to. So far, so good. Before I do any serious listening, I play a test CD to make sure everything is in phase, make some measurements using white noise to calibrate volume levels, and monkey around with the position and angle of the speakers. I could tell something special was going on just from sound of the white noise. I've never heard it so smooth and even, and it retained this quality as I moved about the room. An auspicious start! The Carmel uses a technology we call FocusedElimination. It is essentially a "fancy word" for saying that we don't just stuff damping material inside our enclosures in order to eliminate resonances, but rather we apply pinpoint resonance-absorption only in the exact location where the resonance would otherwise occur. This means that we don't suffer from nearly as much friction as a stuffed enclosure would. Now, here is how friction negatively affects low-level performance: friction means that instead of the cabinet acting as an ideal air-spring, it converts some of its elastic energy (i.e. pressure from air compressing and expanding) into heat. This portion that is converted into heat is unfortunately not linear - at lower volumes, more of the air movement is hindered by the stuffing than it is at higher volumes. Therefore, low-level performance suffers. In the extreme case, below a certain volume threshold, the static friction of the stuffing is too high for the air to penetrate, i.e. it doesn't move at all and the entire cabinet acts as a "rigid, stationary air wall" behind the driver, not allowing it to move at all. At slightly higher volumes, as the air manages to move only during part of the driver's movement cycle, the driver suffers from an effect known as "stick-slip", which is a particularly nasty form of distortion. Subjectively, the former effect leads to the decay of musical instruments ending prematurely through the speaker, and the latter results in a dry, "constipated", energy-lacking sound at low volumes. Having had the Carmel in place for six months now, I am surprised at each listening session just how freely music flows from it. This is not just a result of its superb linearity, but also a direct result of the way it reproduces bass. The vast majority of dynamic speakers are based on the bass reflex principle with one or even multiple ports. Even the exotic Wilson Audio Sasha is a ported design. However like archrival Magico, YG takes the purist approach of using an infinite baffle or sealed box design. This tends to be less efficient than a ported design and the bass response may start to fall off earlier. On the plus side, the fall-off in response, when it comes, will be less steep, and the bass produced much cleaner. So it is with the Carmel. Bass has amazing speed and articulation. It's as clean as a whistle with not a trace of the boominess that afflicts so many large speakers. A bass line is as focused and well pitched as anything in the midrange. This means the speaker achieves a magical integration of the low and midrange into a seamless whole. A run from one end to the other of the 88 piano keys delivers the consistency through the octaves that you hear in the concert hall but which eludes almost all HiFi systems. Now I'm not telling you this is the best bass I've ever heard, because this is not a full range speaker in the way that its bigger brothers can be described. We're dealing with the laws of physics here, and there's only so much deep bass that can be produced by a single 7" modified Scan-Speak woofer and a cabinet of this size. So it is quality not quantity I'm talking about. The bass response tapers off smoothly rather than falling off a cliff as so often happens in a ported design and this too makes for a more natural sound. It goes without saying that port noise is entirely absent (no port-noise-complaint here). Let us examine the other end of the spectrum. The high frequencies are the key to a speaker's musicality. If you have a three way speaker, try this simple experiment. Disconnect the woofer and likely the music still makes sense, albeit without the sheer grunt and drive you are used to. But disconnect the tweeter and the music just falls flat and becomes unlistenable. YG has implemented a superb tweeter here. 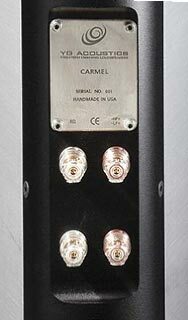 According to their website Carmel utilizes Scan-Speak drivers, modified to YG Acoustics specifications. The tweeter, which is assembled in-house, is a highly modified ring-radiator type. It offers greatly extended bandwidth, linearity and power-handling. I don't care how they get there, but I am thrilled with the results. The high frequencies emerge clear and sweet with unlimited extension and wide dispersion. It is quite the best treble I have ever heard in my house, and as with the bass, it's superbly integrated with the midrange. The drivers, excellent though they may be, do not dictate the performance of a speaker, they just put a top limit on what can be achieved. Next we must consider the cabinet design and the crossover. The Carmel inherits many design traits from its bigger (and more expensive) brothers, the Anat and Kipod. You can forget about wood or composite materials � we're talking an aircraft grade aluminum chassis, machined in their own workshop to incredibly tight tolerances with no two sides parallel. The website reads FocusedElimination anti-resonance technology keeps mechanical losses lower than any competing speaker, by combining the minimized turbulence of a sealed design with the low friction otherwise associated with enclosure-free concept. As for the crossover, designer Yoav Geva has developed DualCoherent software which he claims can optimize a crossover design for frequency response and phase coherence at the same time � normally you can have one or the other but not both. Then there's the looks. Nothing beats the incumbent Wilson Benesch Act 1 on this score with its mixture of Cherry wood and curved carbon fiber side panels. The Carmel looks fine to my eyes, sleek, elegant, thoroughly modern and much more attractive than the Anat and Kipod. The guests who have been through my living room have been favorably impressed with the design. The Carmel is available in silver (as tested) or black finish. It sits on three adjustable spikes, two at the front and one at the tapered rear. The Carmel is an easy load for an amplifier and also uncritical with respect to positioning. 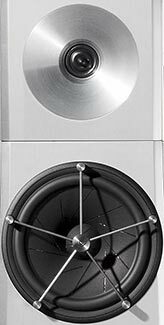 The narrow rear profile is one factor here, the absence of porting another, but a lot of the credit goes to the selection of drivers with very wide dispersion patterns and the way the tweeter is placed within a shallow waveguide cone in the metal baffle. You can place the speaker closer to corners and rear walls than many rivals, and you also get quite a wide sweet spot. By adjusting the height of the rear spike you can fine tune the angle of radiation of the tweeter, and by adjusting the toe in you can optimize the response for your room. I found best results with the speakers aimed a few feet behind me, situated about 8 foot apart and about 18" from the rear wall. Now to the meat of the matter. There are certain speakers over the years that have achieved a level of realism that makes you forget the equipment and just take a deep dive into the music. The connection is just that strong. Chief among these have been the TAD Model One and Reference One, the Magico Q5, the KEF Muon and the Revel Salon 2. To this list I must now add the YG Carmel. It's the least expensive speaker on the list, and it is that good. Compared to the others on the list, it doesn't dig as deep and it doesn't play as loud. But its immediacy, tonal accuracy, resolution, speed and imaging are simply astonishing, even by the highest standards. There is no way this pair of speakers is going back to the State of Colorado where it was born. I'm addicted. No easy matter, since I've been very happy with the astonishing modified Wilson Benesch Act 1 speakers these many years and they've seen off all comers. But the Carmel has all the strengths I value so much in the Act 1 � speed, imaging, low distortion and superb linearity chief amongst them. The Carmel pushes each of these qualities up a notch or two and adds a much improved purity at the top end, a significantly more even frequency response and improved clarity at low volume and under stress. The Act 1 and the Carmel could be brothers in fact. Both are technological marvels, slim, elegant, using exotic materials and finished to impeccable standards. But it's really the sound that marks them as brothers. Neither adds an iota of midrange warmth. If it's in the signal, you get it, if it's not you don't. No sugar coating here. Neither adds that little boost to the low frequency response to give the impression of a deeper low bass that might please the ear, and neither optimizes the imaging for a tightly defined hot spot, a trait that for me has spoiled a number of otherwise excellent speakers. I suspect neither is voiced by ear after the engineers have done their engineering best. Such tinkering may make the speaker more interesting or appealing but if it's at the expense of accuracy, count me out. I've listened to a lot of music through the Carmel, and it seems completely at home in every genre. I did manage to catch it out just once and under extreme circumstances. The phenomenal new SACD of Britten's Orchestra with Michael Stern conducting the Kansas City Symphony, recorded by Prof. Keith Johnson [Reference Recordings RR-120SACD], is captured at what appears to be a very low level, so I turned up the wick. In fact the overall level is set deliberately low to allow the amazing percussion thwacks near the end to be captured without any limiting. In other words there's an absolutely extraordinary dynamic range on this recording. At the climax the woofers did max out. Most other speakers would compress or simply soften the highest amplitude transients. The Carmel is about the truth. So like Schnabel playing Beethoven the way he felt it should be played without making allowances for the limits of his own dexterity, the Carmel tries to tell the unvarnished truth and occasionally runs into the laws of physics regarding maximum excursion. Time to turn the volume control down a notch. So you might think from this that the Carmel is limited in its maximum volume. I'm sure it is, but I never again ran into those limits. It can put out prodigious volumes of sound, and never seems to compress on peaks in regular listening. Its limitations are very specific in turns of sudden extreme low frequency transients. The other speakers on my short list are much larger and better equipped to handle these transient peaks, as I imagine are the larger YG speakers which I have not had the opportunity to test. Today I played a disk that was given out for free by the City of Stratford (Ontario) for answering a few question about tourism in the high street there. It's from a box of Mozart String Quartets dedicated to Haydn and played by the Orford String Quartet on the CBC label [SMCD5040-2]. I wasn't expecting too much from a freebie but the immediacy of the sound is truly captivating, and this great music just springs to life in my living room, courtesy of the Carmel. This magic is repeated whatever disc you play. The dynamics are so great, the string tones so realistic, the sound so full of detail and harmonic accuracy, the listener is immediately transported. But if you take instead a disc with outstanding recording quality, the results will just blow your mind. The 2004 pairing of Alfred Brendel with his son Adrian performing Beethoven's Complete Works for Piano and Cello [Decca 475379-2] is a case in point. The warmth generated by these two superb musicians is entirely natural. The recording places you close enough to the performers to catch every subtle shade and interplay. There's no etch nor loss of fine detail. Very soon you forget you're there to review equipment. The pen slips from the fingers, you lean back into the music and the next time you look, two hours have gone by. How sad that so many of the greatest classical performers of the 20th century did their best work before the availability of top notch recorded sound. Schnabel, Cortot and Toscanini for sure, Beecham, Callas, Bjorling perhaps. Arthur Rubinstein on the other hand became more musical the older he got, before he began to lose some of his technique in his eighties. But the coupling of Schubert's D960 Sonata and the Wanderer fantasy [RCA 09026 63054-2], recorded in 1965 while he was in his mid seventies is an astonishing achievement, and he receives the best sound quality of his life in RCA's Italian studio. Playing through the EMM Labs XDS1 and Pre 2 with the Modwright KWA 150SE, this RCA Victor recording, never before published, is the closest I have ever heard to Rubinstein's sound as I remember it from the half dozen times I heard him in the concert hall. Everything is here, power, grandeur, sparkling treble, deep bass runs, the Carmel reveals it all. No pianist ever had such a wondrous limpid tone as Rubinstein, and the object of this hobby, to me at least, is to hear an artist such as Rubinstein in all his glory again. This setup not only transports me in classical music, but can do the same for jazz and every other kind of music. Holly Cole's Girl Talk [Alert Z2-81016]is a revelation here. This disc is so well recorded as to sound wonderful on just about any stereo, but I was not prepared for what I heard with the Carmel. "My Baby Just Cares For Me" emerges with the cleanest, tightest, most energetic and detailed sound picture I have ever experienced. Garett Brennan's "The Dog Song" from The Blue Coast Collection [Blue Coast Records BCRSA1012] shows a delicacy and subtle harmonics to blow your mind, while the more mainstream Jennifer Warnes SACD The Well [Cisco 2034] brings such warmth, clarity and immersive power you simply cannot believe that's a 7" woofer. Warnes' voice on "Too late Love comes" has all the presence, color and dynamics you could wish for. Set first against a silent background and then joined by one instrument at a time, this is enormously effective. "Invitation to the Blues" is another demonstration quality performance as is the title track, and all delivered effortlessly yet with full force. That the Carmel belongs in the reference class is unquestionable. More than that, I have selected it to be my new reference. That's just going to raise the bar for any new speakers that come my way for review. Some of you may prefer a more laid-back approach, or a speaker with greater low frequency extension or a higher maximum sound pressure capability. I'm not promising this speaker will press your buttons as fully as it presses mine, but if you are spending upwards of $15,000 on a pair of speakers it's worth going out of your way to give the Carmel a listen. You can thank me later. We sincerely thank Phil Gold for a highly informative, thorough, and "music-oriented" review. We truly feel that Phil has captured the essence of the YG Acoustics Carmel, and described with such clarity the experiences he has had listening to music through this precision-instrument. This is some very impressive journalism. We appreciate Phil's very accurate assessment that YG's larger speakers are equipped to handle even larger volumes. YG Acoustics does in fact produce bigger relatives to the Carmel that offer that same addictive quality that Phil experienced. The Anat III series speakers in particular are designed for larger rooms where the need for correspondingly larger volume capabilities is greater. To us at YG Acoustics, the greatest compliment is when a highly accomplished and seasoned professional like Phil chooses to purchase our speakers for their reference system. Thank you Phil for this compliment, and we wish you many years of enjoying wonderful music through our speakers!